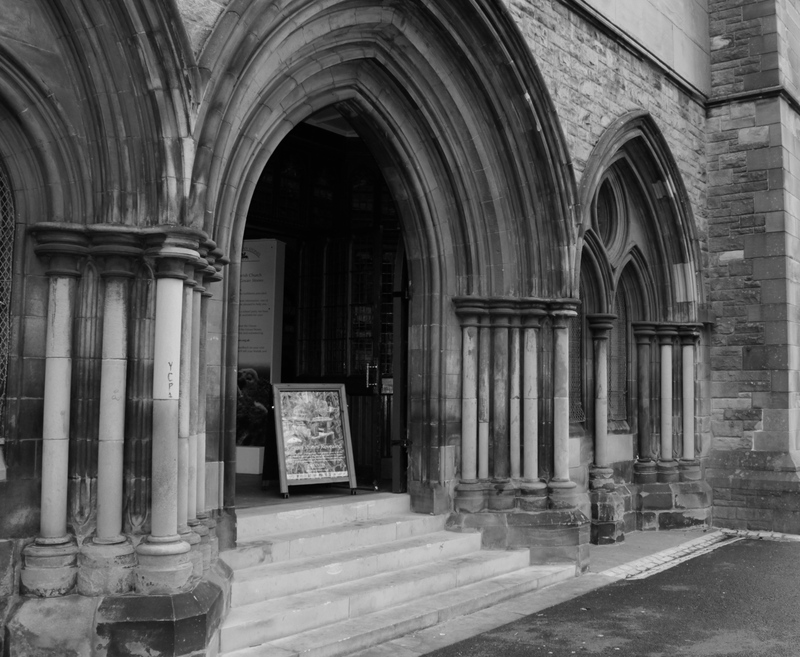 A trip to Govan Old Parish Church had been high on my list of Glasgow attractions for a good few months, but the announcement of the resumption of the 250 year old ferry service, running between the Riverside Museum and Fairfield Heritage Centre (Partick and Govan) was a strong sign that the time had come for an adventure. Naturally, I was late for said adventure and ended up settling for the thoroughly ordinary Subway to get to the church on time (they are open to visit daily from 1pm-4pm) but can confirm that they are easy peasy to find from Govan SPT, and the ferry excitement will be detailed shortly, for the way back North. 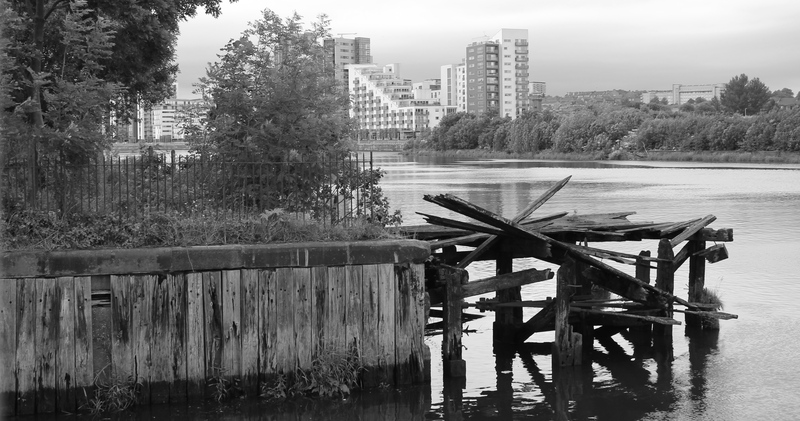 I had known Govan to be a shipbuilding superpower, still home to some rather fancy buildings although the shipyards are long closed, but what I hadn’t realised was its importance in a much older society a thousand years ago. 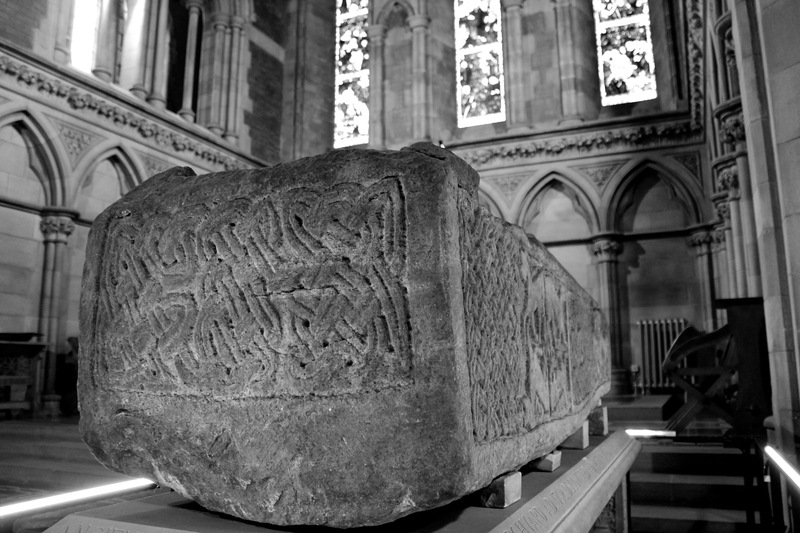 It was a big enough power to be fought over by many conflicting forces, from their neighbours; the Scots and the Picts; to the formidable Vikings, and the stones still living at the Parish Church today are relics from a time when Govan was the Royal centre of the new kingdom of Strathclyde, in the 12 century. 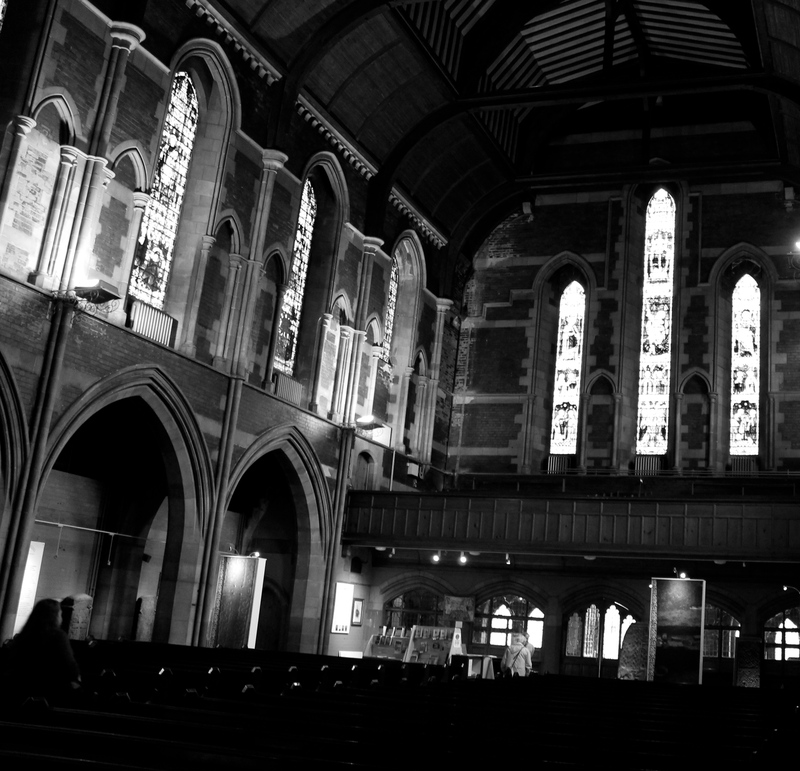 The most recent Govan Church (historically, favourite pastimes included endlessly rebuilding churches to make them look modern) dates from the Victorian era and has some excellent stained glass too. When I arrive, guide Fraser offers to show me around and he is very knowledgable. For as much as we know about these stones, a lot remains hidden and some of the work has been carved over (upcycled, if you will) so many times that it becomes difficult to determine what they may have originally shown. 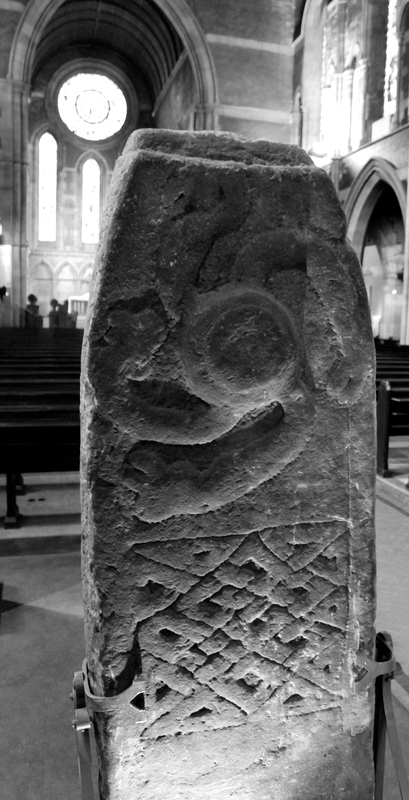 We start with several great carved slabs, which seem to have once been crosses. Officially the Sun Stone, could be the Snake Stone… the Circle Stone? All depends on what your eyes see. 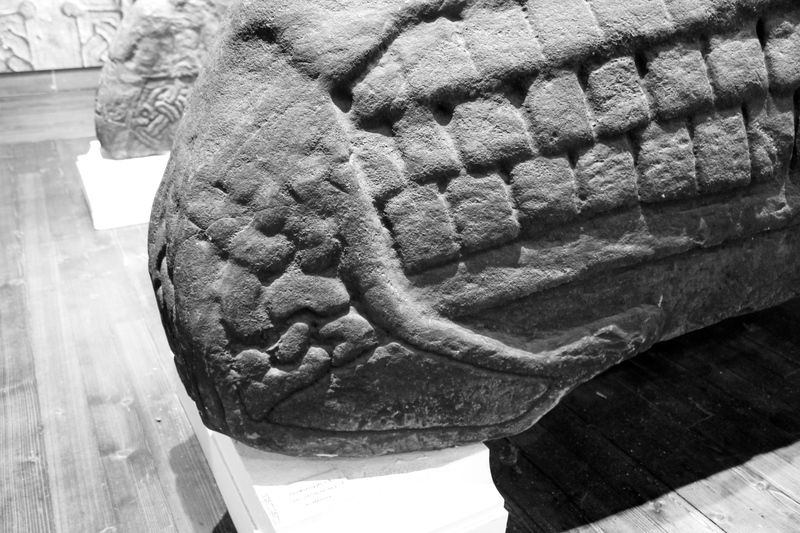 The distinctive Hogback stones occupy a space on the left, and having always thought of them as being rather reptilian looking, I surprised to realise that their scaly backs are more like roof tiles. The ‘house for the dead’ concept spans several ages and beliefs, so these were probably used in burial ceremonies, but the stones here also seem to be customised with animals lounging about too: look closely and see what you can make out. Could be a tail, belonging to whom… who knows? 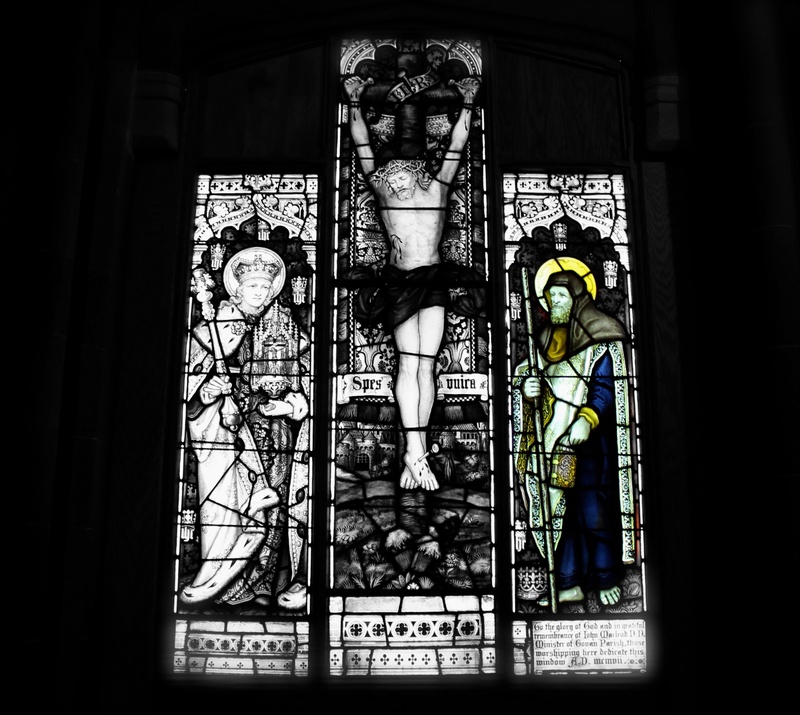 On the way to final (and perhaps most unusual) piece of stonework we stop to admire one of the Victorian stained glass windows with a famous figure – and it’s not the one you think. On the right, we have a depiction of Saint Constantine, a Christian missionary who arrived in approximately 500AD and without whom there wouldn’t have been a church in this very spot, as he built the very first humble wooden structure 1500 years ago. 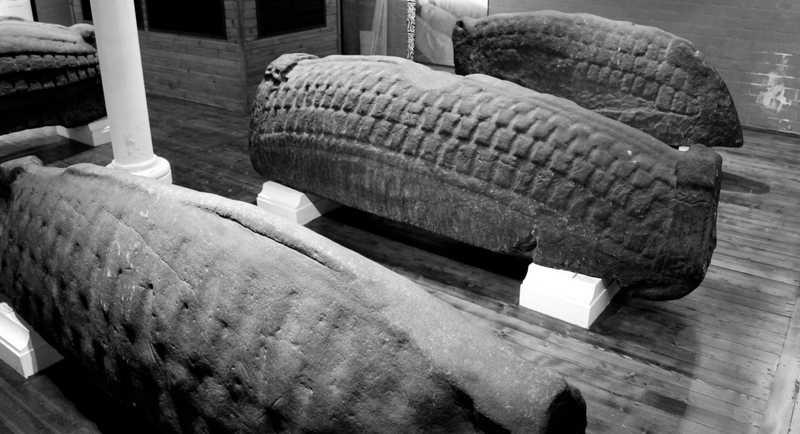 He was supposed to have been buried in the graveyard at Govan (making this a very ancient burial site indeed, stone Hogbacks aside) but his shrine seemed to have been lost over time, until 1859 when a stone sarcophagus, one of very few of its kind, was discovered buried outside the church. Although dating is tricky, it is fairly unlikely to have belonged to Constantine as that would make it incredibly old. It is, nonetheless, a very fancy resting place, carved from a single stone, and probably belonging to a King as it would have been quite complicated to create. 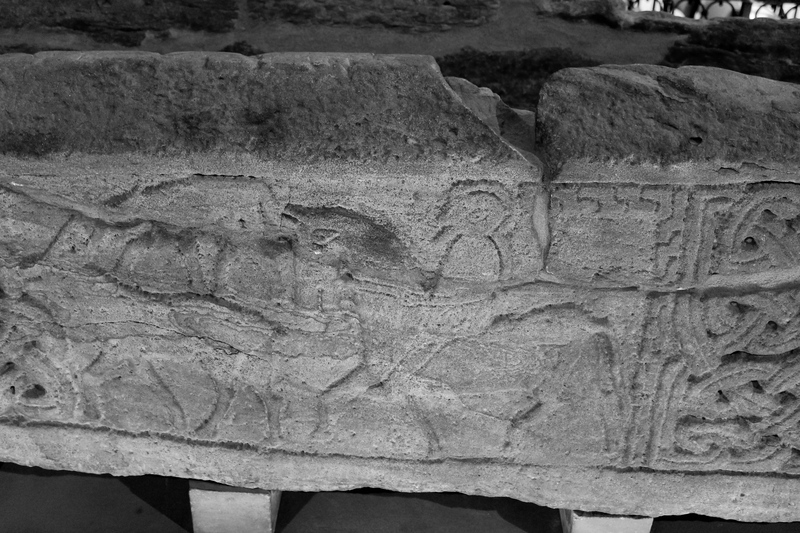 There are all sorts of carvings to be seen along the panels, but like the other stones which seem to have been appropriated over the years as fitting memorials, the sarcophagus also seems to have served other purposes, such as a feeding trough to some very lucky animals. Perhaps this was to ensure they were only eating top quality, perhaps another reason will be suggested for the holes drilled into the base. Perhaps you will be the one to suggest an alternative use! The stones are currently free to visit, so make sure to spend an afternoon with this very old, unique collection. As if the free entry wasn’t enough, there is now an even greater incentive to visit: the ferry is back in action and it will also cost you nothing more than whatever you choose to kindly donate on your way across! The timetable can be found here, don’t forget your pirate hat. 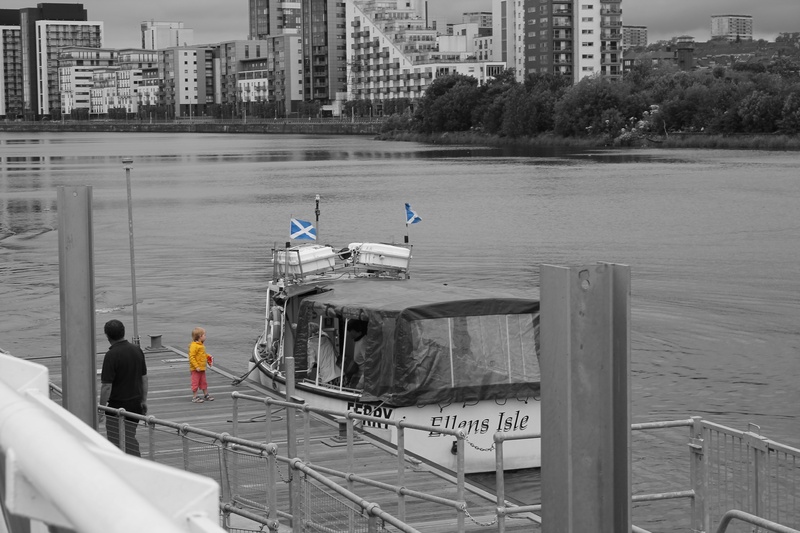 Even on a rainy day, the ferry trip afforded some rather lovely views along the river and added a bit of a sense of occasion to the day. There are other places in the Southside which I have yet to visit, so I’ll definitely be coming aboard again soon. Will you? I work by the Riverside and keep meaning to visit this – and try the ferry! it’s easier than ever now! I would also like to visit the heritage centre at Fairfield. I am enjoying reading your posts, I lived in France for a year and spent quite a lot of time in Paris so it seems we have a bit in common. Thank you for reading! You seem to have talent for finding different stuff to do in Glasgow. I was better at searching in Paris, but I have more free time now so will check out some of the stuff you recommend. That’s lovely of you to say! Most of my knowledge comes from asking strangers what their best recommendations are… once they get over the abruptness of the question they are often happy to help. So with that in mind… do you have any favourite Glasgow attractions? Haha as good a way as any. 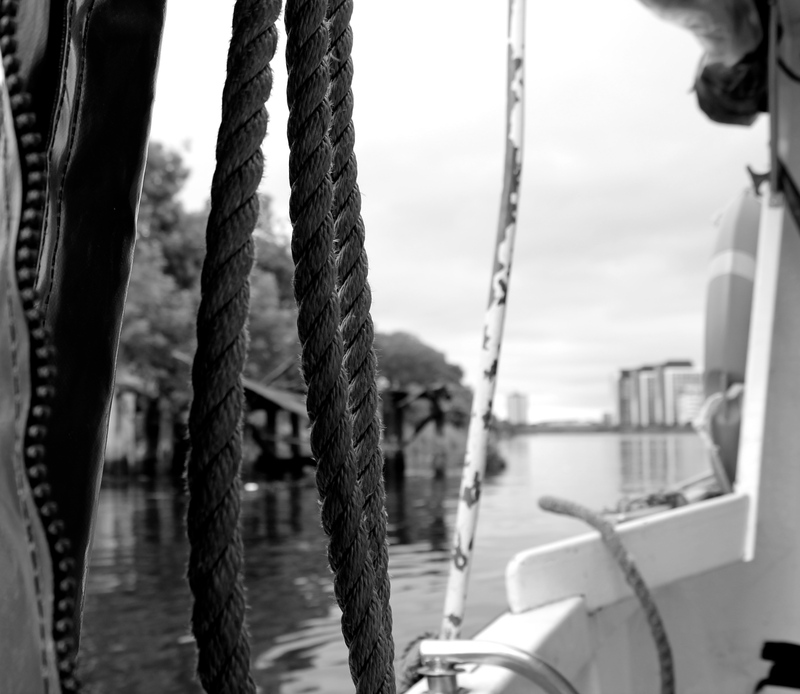 Most of my exploring has been through taste so far, the 78, Hanoi Bike Shop, the Hidden Lane tea room…but the Burrell collection and the Tall Ship are both free and pretty underrated. Next on my list is the Central Station tour though! i haven’t seen the tall ship, although I loved the transport museum. i’m planning on going back soon with a blog post in mind. The station tour is great, enjoy, and thanks for the tips! Friends had already recommended a visit but your blog post pushed it to the top of our ‘must visit’ list. Great post about a hidden gem.